Eighteen-year-old Gumeet Kaur is flying high these days. Life has come a full circle for her ever since her parents allowed her to pursue her dream of becoming an airhostess. In restoring the annual confidential report (ACR) writing powers of Adviser Pradip Mehra, UT Administrator S.F. 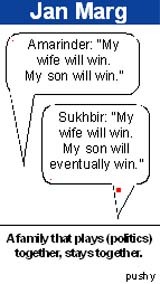 Rodrigues seems to have relented only partially indicating that the cold war between Chandigarh's two top functionaries is far from over. While the restoration of Mehra's powers to write ACRs of his subordinates is seen is as an attempt to mollify the Ministry of Home Affairs (MHA), which had repeatedly directed Rodrigues to restore the powers “forthwith” the administrator is yet to respond to ministry's queries on the quasi-judicial powers of the Adviser. 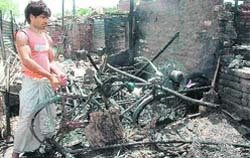 Three members of a family, including a 12-year-old boy, were seriously hurt while two goats and around 20 chickens were charred to death in a fire that broke out in a slum in front of Sector 25 Cremation Ground late last night. In another incident, the entire second floor of Max New York Life office in Sector 8 was gutted early this morning. For Raj Kumar Pardasani, a resident of Sector 11, Panchkula, also a heart patient, withdrawing money from an ATM proved to be a double trouble. He was trapped in an ATM cabin and when after a lot of toil he managed to come out by breaking open the door, he was detained by bank officials for damaging their property. In a decision that may bring transparency in the working of the Chandigarh Administration, the Central Information Commission (CIC) has issued directions to the administration to properly implement the Right to Information Act, 2005. The Congress and the BJP candidates from the Chandigarh Parliamentary seat - Pawan Bansal and Satya Pal Jain - today got support from different quarters. The rally organised by the Congress in a public park in Sector 4 here this evening has kicked up a row with the BJP and the INLD raising objections over it on the plea that it was held without the permission from the administration. The rally was addressed by Congress candidate and sitting MP Selja Kumari. In the first election-related violent incident, at least 20 supporters of the SAD-BJP and Congress were booked in two separate incidents in Phase IX last night. With elections around the corner, the political parties never miss a chance to get publicity. Given even a small opportunity to sing praises for their leaders, the party workers jump at it. With the number of fire incidents increasing each day in the city, the UT fire and emergency department organised a fire show marking the concluding day of the Fire Safety Week at the Sector 17 fire station today. 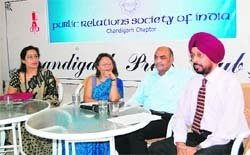 The Chandigarh Chapter of Public Relations Society organised an interactive session to mark the National PR Day today. Finding increased imports of soda ash into India from China responsible for causing market disruption in the domestic soda-ash industry, the government has decided to impose a “safeguard duty” of 20 per cent on imports from China. Panchkula boy Tushaar Batheja won the national champion trophy at the 11th National Abacus competition held in New Delhi on Sunday. Balwinder Singh, an IPS officer of 1976-batch of the Andhra Pradesh cadre, has taken over as Additional Director in the Central Bureau of Investigation. Panjab University has set up a new institute, the University Institute of Hotel Management and Tourism (UIHMT), to start two new courses i.e. BSc in hospitality and hotel administration and BSc in tourism from the academic session 2009-10. Members of the Government Teachers’ Union, Punjab, today staged a dharna outside the office of the Director Public Instructions (DPI) (Secondary), Punjab, in Sector 17 here in support of their demands. Two men were crushed under a speeding train in two separate incidents. The bodies of the deceased have been kept in the mortuary of the civil hospital for identification. 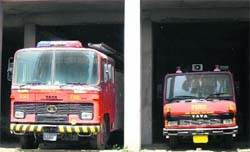 It may sound bizarre, but it’s true that the district fire office in Fatehgarh Sahib, which is supposed to cater to 82 villages, answers distress calls of only those who are “personally” known to the fire officer. To a layman, this may seem as if fire tenders are sent to douse flames only on ‘sifarish’, but the truth is that the fire station has no direct telephone line or 101 facility. The local police had booked five people today after a resident of Rajpura committed suicide by jumping into a river. In her complaint to the police, Usha Rani, wife of the deceased, Satish Kumar, alleged that Jeewan Kumar, Subhash Kumar and three others had been threatening her husband and were not returning the money they had taken from him. The state government had suddenly woken up to woes of families of farmers who had committed suicide. This was a mere poll plank the SAD-BJP government was playing to ensure victory in the forthcoming elections, said Congress leader Rajinder Kaur Bhattal. The Punjab and Haryana High Court wants proactive approach to be adopted while dealing with cases involving the interests of minor- maintenance and property sale matters included. Taking up a petition on the sale of gold coins and pendants by Shri Mata Mansa Devi Shrine Board, Justices Jagdish Singh Khehar and Uma Nath Singh of the Punjab and Haryana High Court issued notice of motion for July 13 to the State of Haryana and other respondents. Additional District and Sessions Judge R.S. Attri has sentenced a Jalandhar resident, Navin Kumar Uppal, to 10-year rigorous imprisonment (RI) for possessing charas. Shiv Raj Vohra, a 61-year-old Panchkula resident, was crushed to death by an unidentified speeding vehicle near Kalagram, here this morning. Besides, four two-wheeler riders were injured in the past 48 hours in different road accidents. A 30-year-old married woman allegedly committed suicide by hanging herself in her house in Sector 69 here today. The deceased, Pooja Sandhu, was found hanging from the ceiling fan by her hudband, Vipin Sandhu. 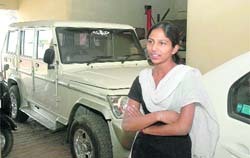 Savita Rani, a resident of Sector 10, alleged that her brother-in-law Manjinder Singh forcibly took away her Honda City car (CH-03-N 5731) today. Host New Public School (NPS), Sector 18, cagers outclassed Chandigarh Baptist School by 31-17 in the girls’ section on the second day of the Youth State Basketball Championship being held on their premises, here today. A fine unbeaten knock of 54 runs and magnificent bowling of Kappv (five for 58) enabled MCA team to beat APJ team by seven wickets during the CCA Under-13 Cup 30 overs A-side Tournament held at MCA ground here today.